Charles Rice-González, October 2011. 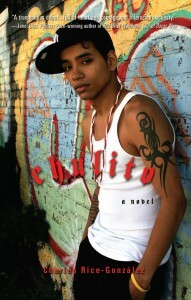 Chulito is a small-time drug runner and high-school dropout with a secret: he’s crushing hard on Carlos. Carlos and Chulito were childhood besties, but Carlos skipped two grades, stopped dressing and talking street, went off to college, and came out of the closet. Now Chulito’s buddies on the corner harass Carlos whenever they see him, and the two certainly can’t be seen together….and yet Chulito can’t stop thinking about Carlos. Despite the street-culture background, the book is filled with queer people – the neighborhood drag queen hangs out her window begging passersby for drugs and popsicles. The Korean kid who works at his family’s Chinese restaurant wants Chulito to fix him up with any male friends who like Asian boys. The travel agency down the street is run by Julio, an older gay man who serves as the story’s moral center and voice of reason. At the end of the book, Chulito comes out to his boss Kamikaze, whose support and continued love means a lot to him and strengthens his resolve to come out to his other friends. When he does, violence results, but all it really does is separate the homophobes from the true friends who can deal with Chulito’s new relationship. Kamikaze isn’t as happy for Chulito when he announces his decision to leave the drug-dealing game; Kaz pulls a gun on Chulito in a dramatic scene, but continues to have his back in the end. The book is a page-turner, tautly written with dialogue and details that carefully build a world many readers will never experience in real life. My only quibble is that it could have used better editing. A big publishing house would have the editorial talent to correct some pretty serious structural flaws, like a few shifts in perspective which seem to unintentionally switch the POV to Carlos’s. Maybe that’s been cleaned up in the final version, since what I read was an ARC. Nevertheless, highly recommended. This entry was posted in 2011, asian american, biracial, bisexual, Charles Rice-Gonzalez, drag, gay male, gay-bashing, genderqueer, latina/o, problem novel, queer adult, queer protagonist, realistic, romance, secondary queer character, sexual violence. Bookmark the permalink. You need to include ***SPOILER ALERT*** if you’re gonna give away ending details like you do!!! You’re right, Alan. I used to have this in the header, but I guess it fell out in a later version. I’ll add it back in.